Gus: Pearl, what are you doing? Pearl: Online dating. I'm trying to find my Valentine. 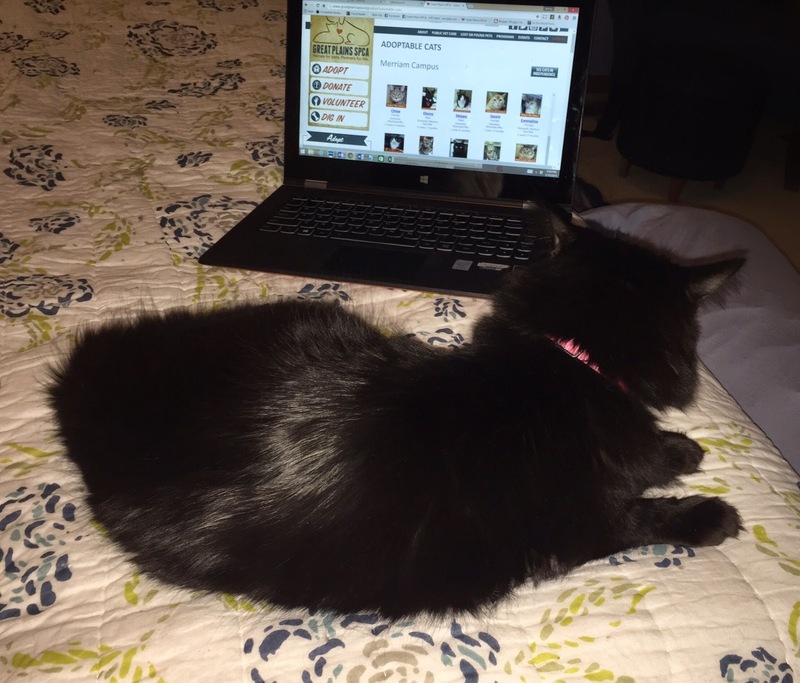 www.GreatPlainsSPCA.org is a great online dating site for cats! It is so much fun! Gus: Pearl, you know the cats there are available for adoption, right? We made Mama promise she wouldn't adopt anymore cats if she volunteered there. Pearl: I know. I'm just flirting. We send messages back and forth on Mama's volunteer clothes. I don't know how I will choose my Valentine! Ebony is very handsome and witty. Skippy is so cute. And Boaz always says the sweetest things. Boaz is a little young for me though. I may look like a panther, but I'm not a cougar. Then there is Earl Grey and so many more, oh my! Gus: Mama needs a Valentine. Maybe we should sign her up for one of those human online dating sites. She's been wanting to date a Cat Guy. Pearl: You realize humans actually meet each other when they online date. He might come here to the house, Mr. Runs-and-hides-when-someone-visits. Gus: Ooooohhhh...maybe I'm the only cat guy she needs. Who do you think Pearl should choose as her Valentine? Pearl will sponsor the adoption fee of her Valentine. If her Valentine's adoption fee has already been sponsored, she will sponsor another one in his honor. Who should Pearl choose as her Valentine? Momma sez Ebony is PAWEsome and a HANDsome mancat in Purrson too!